Barbecuing and grilling is not a science, but there are still a lot of ways to go wrong. Nobody likes their meat burnt and dry, nor spending hours to clean a barbecue after a nice meal. To prevent all of that from happening, there are a lot of trick and tips that can be really helpful. Let’s start at the beginning, before putting your meat to get cooked. It is really important that you wash everything after handling the raw meat, also, the plate that you used for uncooked meat, shouldn’t be used again. What else? Don’t leave the meat out in the room temperature for too long, and that is longer than an hour. It won’t be as fresh, and it will allow bacteria to grow faster. When it comes to the grill itself and its heat, some use charcoal briquettes and others smoker. If you are a charcoal kind of guy, but not too keen on cleaning, listen up. In order to clean-up gray coals and ash quicker and much easier, put a couple of aluminum sheets on the inside bottom of your cooker. When it comes to the smoker, many tend to open it frequently. Don’t do that, as it will keep it below the needed heat levels. In the mood for some grilled chicken? If you eat the skin too, rub the outside with oil or with butter, and then seasoned it. The result is a nice, crispy skin. Not a fan of the skin? Don’t season it. Now, let’s talk about the meat. When piercing the meat forks and prongs are not the best choices – that way the juice will escape. Instead, use tongs or a spatula. Rare steaks are a favorite for many people, but you should avoid that when you are cooking a hamburger. Ground beef contains more bacteria and that’s the reason it should be well done. Salt should be added when the meat is cooked, not before. It draws away the moisture leaving the meat dry. Hight recommended is marinating the meat. It’s best to marinate overnight, but if you can’t, try at least for an hour. Besides meat, many like to add some vegetable on their grill. An easy way for grilling potatoes and corn is to put a lot of butter, some salt and then wrap it in the aluminum foil. Last but not least is an advice. Try something new when it comes to sauces. Other than classical barbecue sauce, there are various types of marinades as well as the seasonings. There is nothing better than homemade food. Besides knowing what you are eating, you know you made it by yourself. It is the same when it comes to the sauces. Don’t just rely on the store and what it has to offer. Do something different this time, make your own sauce. It may seem difficult and time-consuming, but believe me, you will love the results. Whatever your taste is like, a variety of choices will surprise you. Plus, they are much healthier and better for you. You can make your own barbecue sauce. They are really not that complicated to make. Usually, you just have to mix all the ingredients together and let it cook while you stir it from time to time. 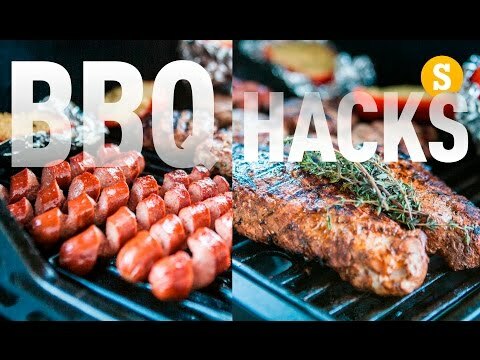 Plus, there is such a variety of recipes for barbecue sauces, and you can add or remove the ingredients that you do not like. Experiment with them and make your all-time favorite. When you succeed in doing that, you will never again buy another sauce. They are not only good for grilled food, you can try them with any kind of food you like. Wait to hear about this homemade beauty – Guinness barbecue sauce. Yes, you read it right. What goes better with barbecue than beer? Now, you can also put the beer in the sauce itself. Who wouldn’t want to try that? Since we started with alcohol sauces, let’s continue in the same direction. A different version of classical barbecue sauce is honey barbecue sauce. If you love honey, you will love this sauce too! Another interesting one is definitely brown sugar barbecue sauce. Pineapple bourbon barbecue is a great one if you want to try something fun, but not a big fan of beer. Like I said, there is a sauce for everyone. Whether you are more of a classical type or an adventurous one, whether you like to experiment with food or not, homemade sauces won’t let you down. Use this as the opportunity to brag a little about your cooking skills. If your keen on brown sugar more than the white, this is the one for you. If you thought that’s all, you are wrong.